Extra cleaning of the South Bank to maintain the attractiveness of a neighbourhood that draws over 30 million visitors every year has been secured by South Bank Employers’ Group. 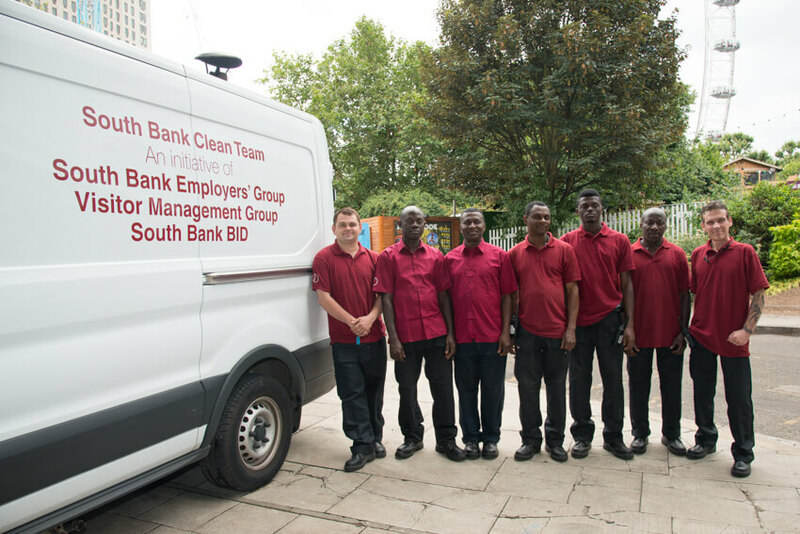 The Clean Team service operates seven days a week, to ensure the public spaces of South Bank and Waterloo are kept clean and tidy and aims to ensure all graffiti in the area is removed within twenty four working hours (or four hours if offensive). The Clean Team service also undertakes pavement jet washing, reporting abandoned bikes to be removed and gritting during the winter months, as well as a variety of other jobs in the area, including polishing street furniture, weeding and clearing landscaped borders, putting up posters and maintaining signage. The operatives are also ambassadors for South Bank, providing directions to members of the public. Employees, residents and visitors can report problems in the area, which will be acted on by our Clean Team. Issues can be reported by contacting the Public Realm team using the Reporting Tool available on the Our South Bank website. The team, also funded by the South Bank Business Improvement District and the London Eye, on busy days removes approaching 100 bags of rubbish. It responds to reports of street problems from our members and the public who contact us.